Yes, that does read about 35 degrees below zero. That was this morning. May I just say it was really, really cold. 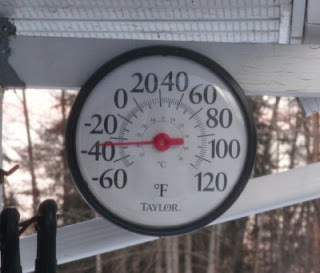 It was so cold that we lost the electricity twice overnight. Starting up the generator was a painful task. Despite being stuffed into all kinds of winter clothes, I wanted to cry because it was so uncomfortable. The poor dog didn't know what to think. 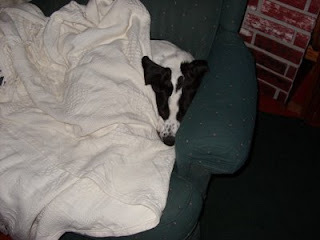 Kai was pretty quick doing his business outside and he didn't seem to mind getting tucked in, even though it was - literally - 100 degrees warmer inside.